http://newiprogressive.com/images/stories/S5/tony-evers-2019-sos-address-s5.jpg Governor Tony Evers takes on healthcare, education and taxes in his first major speech since he delivered his inaugural address at the state Capitol. 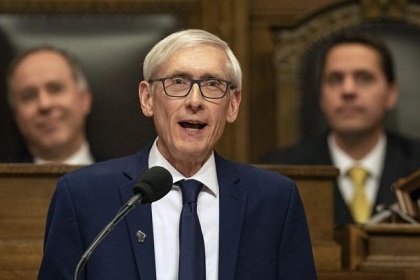 MADISON - On Tuesday, January 22, 2019, newly elected Governor Tony Evers gave his 2019 State of the State Address in the Assembly Chambers of the Wisconsin State Capitol. … We are a state forged by the Wisconsin Idea--the notion that education informs our public policy and that knowledge should embrace the communities we're called to serve. … Fixing our economy remains a priority. That’s why just last week I directed the Wisconsin Economic Development Corporation to create an innovation and entrepreneurship committee focusing on supporting our small businesses, seeding capital funds, and technology development. But there is more to an economy than counting job creation. And the state of our state is more than our unemployment rate. … Connecting the dots means recognizing that what’s best for our kids is best for our state. The investment we make in our kids today will yield dividends for generations. That’s why our budget reaffirms our state’s commitment to our kids by returning to two-thirds funding for schools across Wisconsin. … An economy that works for all of us, healthier communities, more money for our kids and our schools, better roads and infrastructure--that is what the people of Wisconsin expect from us, and that is what the people of Wisconsin deserve. ... Given the challenges we face, I expect the Legislature will focus on these important priorities instead of being distracted by division and preventing us from working together to get things done. That means I expect legislation arriving on my desk will be passed with broad support and in the spirit of bipartisanship. That means instead of taking up an entirely new budget of its own, I expect the Legislature to take up the budget I crafted by and with the people of our state.